For the prevention of heartworms; control hookworms, roundworms and whipworms. Safe for puppies as young as 4 weeks old. For the prevention of heartworms; roundworms, hookworms and whipworms – also sterilizes flea eggs. Approved for puppies 4 weeks or older, 2 lbs or heavier. For the prevention of heartworms, roundworms and hookworms (this product does not aid in the prevention of whipworms). For the prevention of heartworms, roundworms and hookworms in those dogs that have food or environmental allergies (this product does not aid in the prevention of whipworms). We recommend Interceptor as our product of choice. While Heartgard Plus works just as well for heartworm prevention, Interceptor is better at preventing Whipworms, an intestinal parasite. We also believe that Front Line Plus is a better product for flea and tick prevention than Program. In short, heartworm disease is a potentially fatal condition caused by a parasitic worm, which is transmitted, to dogs by a mosquito bite. North Carolina is currently ranked 4th in the nation for the number of heartworm positive animals! Adult heart worms can grow up to 14 inches in length and an end stage heartworm diseased dog can have up to 250 of these worms in its heart and lungs!! Yuck! So, how is this prevented? The best form of prevention is to first, have your dog tested (yearly) for the disease. This is a simple blood test done in the office takes 10 minutes to get results. When the test comes out negative purchase a year supply of Interceptor, Sentinel or Heartgard and give it to your dog monthly to PREVENT the disease. 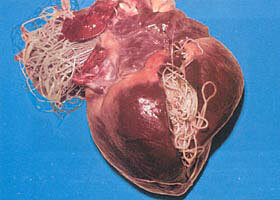 One of the biggest misconceptions is that heartworms are just like any other worms – how very wrong that is. Although a case of round worms can make your loving family member feel pretty cruddy – an undetected case of heartworms can kill them. Just like a human going to the doctor’s office for their yearly exam – your dog needs to go for its yearly exam too. Just like a human, tests are run and blood is drawn and blood pressure is taken; as so with your dog. Your blood pressure is taken to check to make sure that your medication is working – your dogs blood is tested for heartworms to make sure that his medication is working.